LIVE FROM SAN ANTONIO..... The mini diverter and Ultimate Adapter Kit were a big hit in San Antonio. 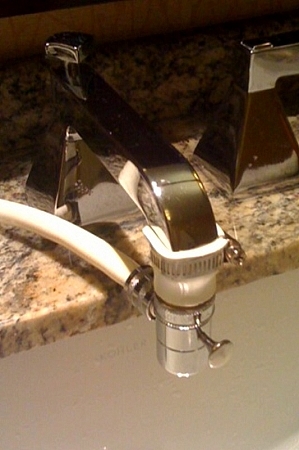 Lots of distributors brought their machines and freaked out when they got to their hotel rooms and discovered square faucets! NO PROBLEM. The white rubber boot (shown here with the mini diverter came to the rescue and worked perfectly. Thanks to Alicia Lowery, here are some pictures of the mini diverter in action. Who says you cant put a square peg into a round hole! When your clients see this beautiful diverter valve they will want it!, and be sure to get the Ultimate Adapter Kit as well so you can hook it up. 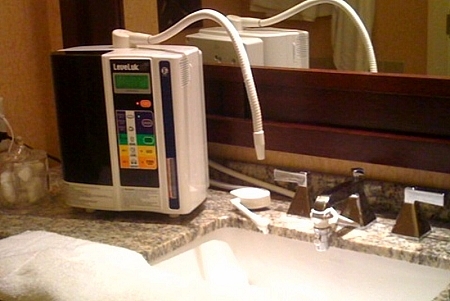 Eliminate the big white plastic diverter and the installation problems. You can swap out the diverter in 10 seconds. Metal threads with rubber washer helps speed up installation and reduces leaks. If you're traveling be sure to look at the ultimate adapter kit, filled with 7 different adapters to help you hook up to lots of faucets.